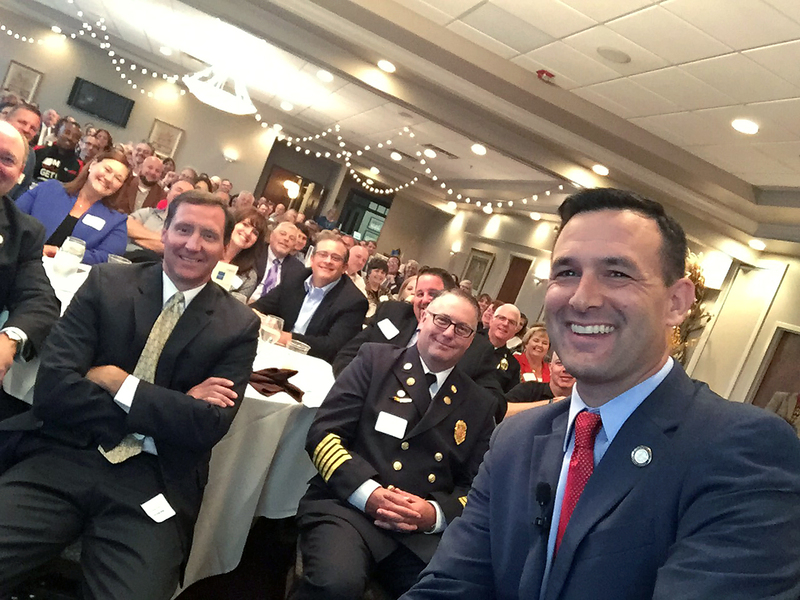 Deputy Mayor Steve Cooke filled in for Noblesville Mayor John Ditslear, who was unable to attend due to an illness, to deliver the annual “State of the City” address to the Noblesville Chamber of Commerce this afternoon at Harbour Trees Golf Club, 333 Regents Park Lane. The city has created the Noblesville Cultural Arts District, which will encourage even more collaboration and creativity amongst the arts and culture organizations. Crosswalks at Eighth Street and Maple Avenue were recently painted by Nickel Plate Arts. Cooke said it’s creative efforts like these that distinguish Noblesville from other cities. The creation of the Riverfront Redevelopment District will attract even more interest to generate greater nightlife from new restaurants and retail establishments in the district. Cooke said it’s not hard to imagine the near future of downtown including more options for living and more retail outlets. It will take a cooperative effort with the private sector as well as the County and an investment from the City. “We are excited to lead this effort and finally make this a reality,” he said. No long-term plans of downtown are complete without a plan for parking that meets the needs of workers and visitors. The next phase of our parking study is coming to a close and the city will soon share the results’ recommendations and plans to improve parking. Another downtown improvement coming are the much needed upgrades to the Conner and Logan traffic signals. This will help make the timing more efficient for east-west travel. 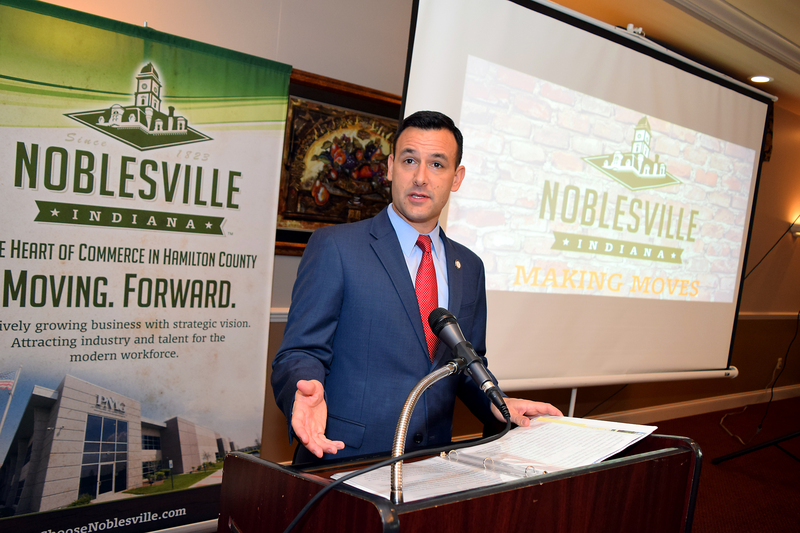 “By the end of 2016, Noblesville will have spent more than $900,000 in the central business district alone on street resurfacing and improvements to alleys and sidewalks,” Cooke said. * Pleasant Street – Noblesville is moving forward with plans to widen and extend Pleasant Street from State Road 37 to Hague Road to create a new east-west corridor. Mayor Ditslear wants Noblesville to take the lead and work with INDOT and the County to assist in financing this plan, which would include a new bridge over the White River. To better inform citizens of this project, the city will be hosting public information sessions in the near future. * Indiana 37 – Noblesville is moving forward with an engineering survey and has already budgeted $16 million for the project. Like Pleasant Street, the city needs to work with its partners for funding options to deliver a free-flowing interchange system to help relieve traffic congestion. 146th Street, which is in the southern portion, is slated to begin construction in the fall of 2018. * Public Safety – The police department will be hiring four new police officers before the end of 2016. These additions allow the department to identify and implement strategies to tackle 21st Century challenges with the latest in intelligence-driven policing. * Parks – Federal Hill Commons, the city’s fifth park, will hold its grand opening in April. It will include lots of green space surrounded by walking paths, a playground, amphitheater and plenty of space for our Farmers Market. As a nod to Noblesville’s past, the park is reusing limestone from the Old Mill and portions of Connor Elementary. As one project nears completion another is set to begin. The 200-acre Finch Creek Park is expected to start construction on its first phase next year. * Tourism – Developers are targeting Noblesville and especially Exit 210. Holiday Inn Express is getting closer to opening its five-story hotel. Last month, the full-service, seven-story Embassy Suites by Hilton hotel and conference center broke ground. With 25,000 square feet of meeting space, Noblesville will become a wonderful option for event planners. * Housing Study – The city has hired a consultant to conduct a housing study to help leaders better plan for growth and to guide future development. This study will answer what housing is available, what’s needed and what are the latest trends. The final study should be completed in a few weeks. * Five Points Roundabout – The roundabout at Greenfield Avenue, 10th Street and Christian Avenue will be bid this winter for spring construction. Due to some unforeseen legal issues, that project experienced a delay. A decision was made to wait until spring to begin work rather than expose the construction phase to winter weather. * Presley Drive – The joint project with INDOT to create a roundabout at 32-38 and Presley Drive will open this week. When it does, Presley Drive will provide a north-south corridor adjacent to State Road 37 and complete a section of our master thoroughfare plan that’s been on the books for a decade. * Riverwalk – This summer, the city cleared trees in the middle section of the Riverwalk between Logan and Maple. The final phase of the city-county project will begin work this fall. The missing link will complete a half mile of trail along the eastside of White River. It will provide pedestrians and bicyclists the opportunity to travel from downtown into Forest Park without using streets. * Trail Connections – Noblesville has identified two major trail connection projects in the north portion of the city. Each is scheduled to begin construction in 2017. They include the Levee Trail that will connect Morse Beach north to 216th Street and south to downtown; Little Chicago Road which will connect existing trails on State Road 38 to the South Harbour Elderberry Road entrance. * Midland Trace Trail – After years of planning and land acquisition, Noblesville will begin constructing its first phase to extend Midland Trace Trail from Gray Road to Hazel Dell Road, which will happen in the middle of next year. “Planning and prep work for future phases is already taking place as well. One day, we envision this trail extending east beyond State Road 37,” Cooke said. The city also has purchased land to create a trailhead off of Hazel Dell. This area will be unlike any other location on the Midland. The trailhead will include restrooms, a water fountain, parking, benches and a bike repair and air station. * Long-Term Control Plan – The city is beginning the fourth phase of its wastewater long-term control plan. This project will provide storm water separation on the north side of Old Town. Logan, Clinton and Wayne streets should also see a significant difference with storm water drainage. * Social Media – The city is starting something new – a Stat of the Week on Twitter and Facebook. This will bring attention to some of the city’s behind-the-scenes departments while informing residents of some pretty neat figures. Followers are encouraged to look for #NvilleSTAT. *Class 2 City – On Jan. 1, Noblesville became a Class 2 City. Among the changes was the expansion of the Common Council from seven to nine members. The clerk-treasurer position was split to an elected clerk and a controller’s office. Other administration changes were the hiring of Steve Cooke as deputy mayor and Sarah Reed as planning director.